Whether you’ve been in the game for a while or are just entering the game, there’s some core concepts to truly understand in order to build a career to a place of satisfaction. Having now been around the block a couple of times i.e. I’m old, I’d like to share a few more workplace truths to tack onto my 2012 piece about Perception Management. In other words, just because you may be a high-performer, doesn’t mean you’re going to earn that snazzy title and a solo-office…or a corner office. WHAT?! Say it ain’t so! Maybe you’re the fastest programmer with least bugs and consistent best end-user experience, maybe the top sales person, perhaps the highest performing middle manager, etc., whatever. And yet, you’re still not getting promoted. Why is that? Have you considered your ability to manage-up? Managing-up is simply managing the relationship with your superiors, in all facets. 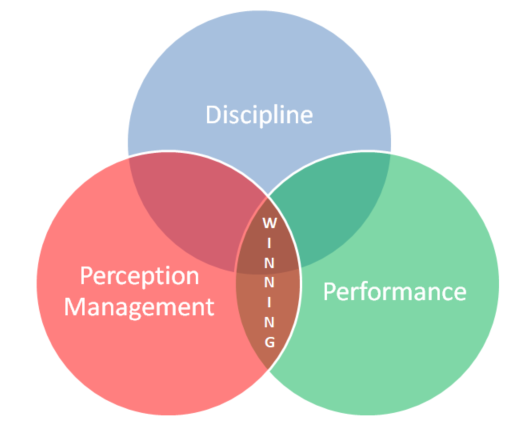 This means you have to manage how you are perceived in addition to “Exceeding Expectations” in your performance. If you’ve worked in any organization long enough, you’ll inevitably encounter upper management or executives and wonder how the heck they got there. Managing-up is how. Control the narrative around your career and you at least have a chance at controlling your advancement or stasis. Combining the ability to positively manage others’ perception of you with your own ability to outperform to expectations is a great way to garner success. Not the best way, but a great way. It is easier to win by cooperating and complementing your teammates’ skill-sets. Even if that teammate is a competitor, by working together, you can both achieve more. Cliche? I know. But why do you think this concept is constantly reiterated in sports and in the workplace? Better to play nice and lift each other up than to look down your nose, judge, plot, and scheme. Leave the plotting and scheming to the talentless hacks who solely manage perceptions to cover for their absence of talent. Concept #3: Discipline! Discipline is the key! 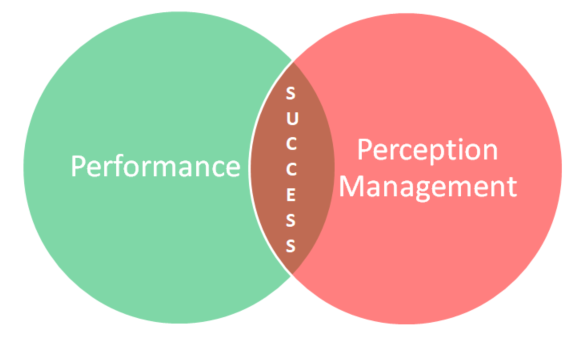 I said out-performance and perception management are great but not the best. Combine those two notions with discipline and there’s the true formula for success. Proven over and over; not statistically but visually, anecdotally, and through the countless commentaries of the successful. How many stories have you yourself read about some successful person you admire where they comment on discipline? It’s also known as the ability to outwork, to consistently apply the process, stay focused, etc. Whatever you want to call it, discipline is about mental-toughness. And combining discipline with concepts 1 and 2, my friends, is how you win in business. Sure, this is a broad generalization. There is nuance to all concepts, but the core concepts are the truth to success in the workplace. Now all that being said, am I some successful, retired-early, self-made millionaire? No. I work for a living with the hopes of getting there one day soon. But I’m just north of 40 years of age and I ignored those three concepts for the bulk of my multiple careers. It cost me. I have had a modicum of success and am just young enough to still apply these concepts and hopefully reach my business goals that much faster. If you’re in your 20’s or 30’s or any age and have somehow come across this post, I implore you to please not ignore these simple lessons shared. They seem like common sense but we all know how uncommon good sense can be.